I had some very happy pooches in the house on Friday when my box of Martha Stewart Pets goodies arrived from PetSmart. I swear, these dogs know when the UPS man brings something for them. I can get box after box of stuff for me and Jake, and the dogs ignore them completely, but the moment a box contains something for them, they go bonkers. PetSmart sent me four different toys (three are pictured below, the 4th one I forgot to include because I didn’t see it in the box right away) and an awesome, comfy dog bed. 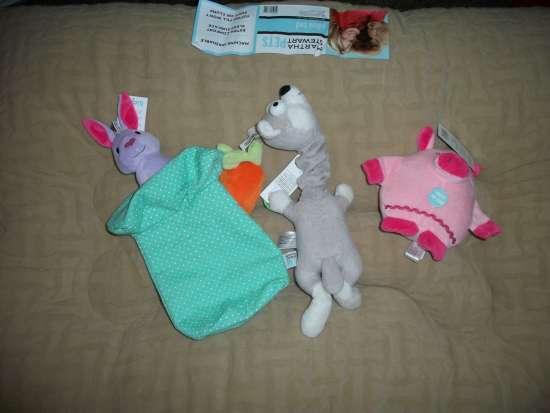 The toys included the Jumbo Animal Squeaker Pig Toy, Dash the Squirrel, Intelligence Toy Rabbit in a Hat, and another plush Character Squeaker toy. As soon as I gave the dogs the okay, they each raced to grab their favorite in the pile. Maia, the alpha, went right for the pig. She loves stuffed animals with squeakers. We call them her “babies” because she carries them around, lays with them, and never lets them out of her sight. 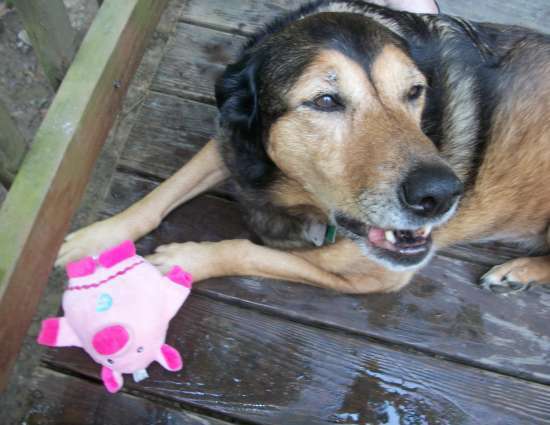 Here she is with her pig. She’s warning Cooper to stay far away from her baby. Tasha loves anything that can be thrown, so she picked Dash the Squirrel. He makes a sound when he’s thrown. She grabbed him and headed to the back door, indicating that she wanted us to come out and throw Dash for her. 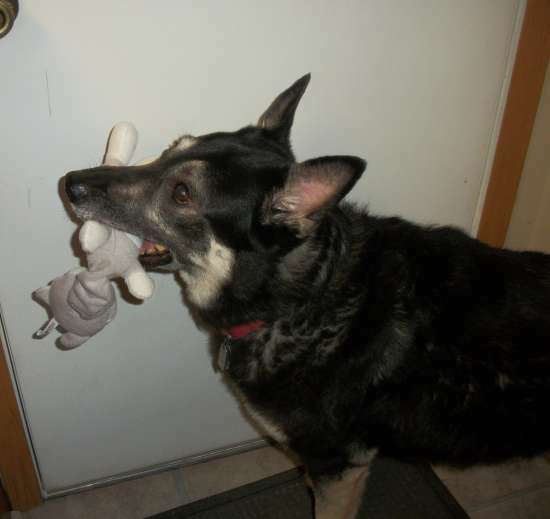 Cooper doesn’t stand still long enough to get his picture taken with a toy, but he started out with the Rabbit in the Hat, then decided on the other plush squeaking toy. He likes to throw his stuff around. He doesn’t really fetch like Tasha, but enjoys tug-a-war and “keep the toy away from the humans.” All three dogs were thrilled with their new toys. 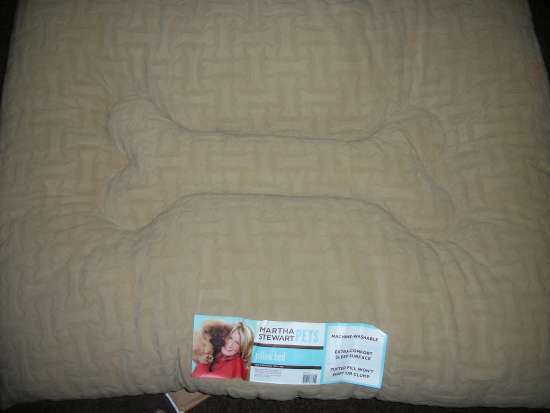 The Martha Stewart Pillow Dog Bed is pretty awesome too. It’s huge, soft, and so comfy even I could nap on it! Well, if I wanted to curl up like a dog, that is. Maia or Tasha will most likely be using it, as Cooper only sleeps wherever my son is. Maia gave it a spin the other night and she seemed super comfy on it. I really like the wide selection of toys, beds, and grooming supplies that the Martha Stewart line features. Don’t forget to enter my Loving Your Pet giveaway for your chance to win a Martha Stewart prize package and other great items for your dog!